Who's eligible: Students and recent graduates from universities in the United States, Bosnia and Herzegovina, Denmark, Germany, Greece, the Netherlands and Poland. The John Lewis Fellowship is a Humanity in Action Fellowship program in Atlanta, Georgia. In partnership with The National Center for Civil and Human Rights, Inc., Humanity in Action brings together a group of 30 American and European university students and recent graduates for an intensive program about diversity and civil rights in America. The program honors Congressman John Lewis, an icon of the Civil Rights Movement. In its first two years, the program explored the history of the Civil Rights Movement, diversity and minority rights in Atlanta. In its third year, the John Lewis Fellowship expanded to focus on restorative justice in Atlanta. As a capstone project, fellows, speakers and staff produced a blueprint plan for the city, titled "An Appeal for Human Rights and Restorative Justice". In 2019, the Fellowship will place an even greater emphasis on community engagement with the Atlanta public through this year's theme, "Grassroots Solidarities: Interrogating the Past and Navigating the Present to Prepare for the Future." The John Lewis Fellows attend discussions with renowned scholars and activists at The Center, visit historical sites around Atlanta and engage in discussions on a range of political and social issues. They also draw upon the immense resources of The Center and contribute to its extensive and innovative outreach initiatives. As part of the program in 2016, Fellows produced a set of reflective essays, "John Lewis Fellowship Presentations," that explored Atlanta's history and contemporary issues challenging pluralistic societies. 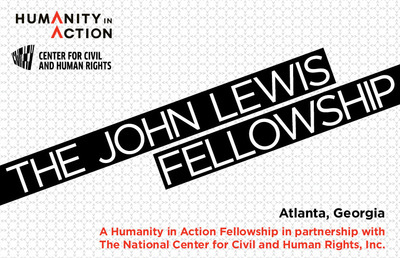 The John Lewis Fellowship in Atlanta is the American program of the Humanity in Action Fellowship. The European programs take place annually in Amsterdam, Berlin, Copenhagen, Sarajevo and Warsaw. The John Lewis Fellowship is made possible by the generous support of the Andrew W. Mellon Foundation provided through The Center.